It always surprises me how people are praising Marvel Studios’ strategy for the “Marvel Cinematic Universe” as if it’s something new. I guess they have forgotten how Toho did it decades ago with their daikaiju movies. I suppose one could make an argument for Universal doing it first, but since most of their stable of monsters were preexisting characters they licensed while Toho’s are all original creations. So it’s very appropriate how IDW Publishing’s Godzilla comic books are the first ongoing American comic series to feature various monsters from Toho’s sizable stable. Like the old Random House Godzilla novels, the comics take place in their own continuity separate from the films and the origins of most monsters differ from what has been established in their various cinematic appearances. Unlike the novels, monsters from previous film eras have been scaled up from their original sizes. IDW kicked things off with 2011’s Godzilla: Kingdom of Monsters and continued the storyline the very next year with Godzilla and the ongoing (as of this writing) series Godzilla: Rulers of Earth. 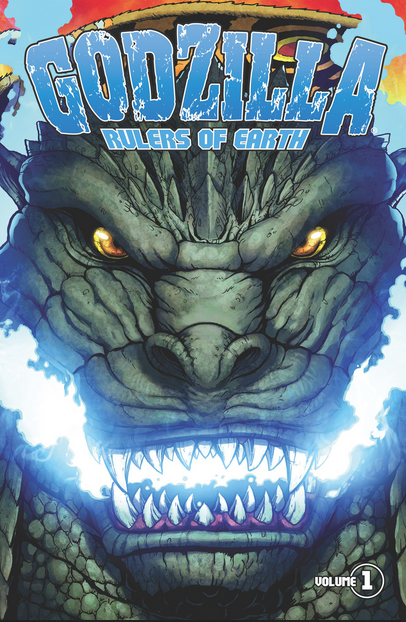 The Godzilla: Rulers of Earth Volume 1 trade paperback collects the first four issues of the series and while that might sound like a lot, there is a lot of action packed into the book’s 124 pages. There’s monster attacks, an alien invasion and plenty of battle sequences. Gigan battles Kumonga, Godzilla takes on Zilla and Destoroyah and even Mothra gets in on the fun! But don’t think for a second that those are the only monsters making an appearance here. You can tell actual fans were involved in the creation of this series, as there are plenty of injokes and references to the original movies scattered across the four issues. I particularly enjoyed the bit involving a larval stage Mothra and Godzilla’s tail! The amusing in-universe explanation for the Zilla’s name was another nice touch. As IDW isn’t creating any original monsters for the series, the monsters don’t seem to get killed off. Sometimes they are upgraded to a redesign from one of the more recent Godzilla movies or multiple designs are used as different versions of the same being (this comes into play more in later issues). Godzilla’s design in the comics taken from his appearance from Godzilla Against Mechagodzilla and Godzilla: Tokyo S.O.S.. I understand this design is even used in a 50’s flashback later in the series! Those who were disappointed with the artwork used in the early IDW Godzilla titles will be thrilled by the work of Matt Frank and Jeff Zornow. The covers by noted kaiju artists Bob Eggleton, Chris Scalf and Arthur Adams don’t hurt, either. In addition to the great artwork and detailed monsters, the use of color is well done and there’s plenty of creative artistic choices. The “fwoosh” panel involving Destoroyah’s wings panel is a favorite of mine. As someone who always appreciated the rare “slice of life” moments in Godzilla movies, I appreciate how the comic details what it is like for a human being to live in a world where these monsters exist and how said monsters effect the world around them. From the isopods shown swimming around Godzilla to the rise of megazoology, there’s plenty to enjoy. In addition to the military, the “human element” of the story is often shown through the adventures of Lucy Casprell and the team of researchers which share her fascination with daikaiju. The story can be jumped right into without having read any previous IDW Godzilla titles, but there are some references to past events which could have benefited from a page at the beginning explaining the story so far, or at least a quick reference guide so new readers can get a better understanding of the story as a whole. From what I can tell, interested parties can skip “out of continuity” miniseries like Godzilla: Gangsters & Goliaths, Godzilla: Half-Century War and Godzilla: Legends without fear of missing anything. As an added bonus, Godzilla: Rulers of Earth Volume 1 includes a cover art gallery along with script samples and character design sketches. I had a blast reading this and am definitely going to seek out the next installments. The newest issue should be arriving in stores today while Godzilla: Cataclysm will be launching later this summer. Hopefully we’ll be seeing even more of Toho’s monsters as well, perhaps even ones from Zone Fighter or the 90’s Mothra series (better known in the US as the Rebirth of Mothra trilogy). Will it tie into the story or will it be non-canon? Only time will tell. Special thanks to IDW Publishing for the review copy!